Death to the Weakling, Wealth to the Strong! Well, we made it – did you go out and break any of the formerly deadly sins? I have to be honest, I was sort of glad when I wrote about the last one, by the seventh sin I was getting pretty bored with the whole thing. We should all be well aware of how non-existent my attention span is, so doing the seven-day exposé was tough. But I’ve always tried to push myself, to not take the easy way, but rather, the path less traveled. 1. In this arid wilderness of steel and stone I raise up my voice that you may hear. To the East and to the West I beckon. To the North and to the South I show a sign proclaiming: Death to the weakling, wealth to the strong! 2. Open your eyes that you may see, Oh men of mildewed minds, and listen to me ye bewildered millions! For I stand forth to challenge the wisdom of the world; to interrogate the “laws” of man and of “God”! I dip my forefinger in the watery blood of your impotent mad redeemer, and write over his…. I should probably mention that I meant the Satanic Bible…. …I gaze into the glassy eye of your fearsome Jehovah, and pluck him by the beard; I uplift a broad-axe, and split open his worm-eaten skull! The medical updates are getting less frequent as I continue to mend. This coming week I have my GP and my Cardiologist, I saw my Neurologist last week and got a thumbs up. She’s one of those older ladies, late 50’s, maybe more – you can tell she is ridiculously tough and most likely able to kill a man with her bare hands. I tell you this because as my appointment was ending she was so pleased with my progress she walked over and gave me a big hug. If you will recall, she has hugged me once before, now it’s pretty well know I am an exceptional hugger, comes from my mom, who used to tour on the pro-hugger circuit in the 80’s. Anyways, a hug from your doctor can only be good, right? I guess unless it’s because they are letting you know it’s terminal…she cleared me to return to work after the christmas holidays, half time for a couple of weeks to ease back into the swing of things. I’ve been off for a year. Monday, November 30 2009 was my last day of work. I understand times have been difficult in the workforce and it means a lot to me both professionally and personally that they kept my position on hold, waiting for me the whole time. True, I don’t think they can legally fire someone on sick leave but, they are running a business and they certainly could have come to me and said, look we’re really sorry but we need to move on and fill your position etc etc…. But they didn’t, my job is waiting for my return. 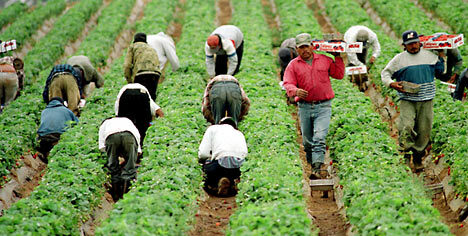 That’s why I love being a migrant worker. I’m quite nervous. It will have been more than a year by the time I actually go back. There are new people, policies, properties, for cripes sake someone could have gotten pregnant, had the baby and returned to work already. Which is super possible, I work with a ton of skanks…. Just kidding ladies… just kidding, see you all soon. If you want the rest of the Satanic bible let me know and I’ll send you a copy… I won’t be reading it…. there is some scary stuff in there….